As part of some of the coding interviews I’ve been conducting recently, the topic of immutability sometimes comes up. I’m not overly dogmatic in it myself, but whenever there’s no need for mutable state, I try to get rid of code which makes code mutable, which is often most visible in data structures. However, there seems to be a bit of a misunderstanding on the concept of immutability, where developers often believe that having a final reference, or val in Kotlin or Scala, is enough to make an object immutable. This blogpost dives a bit deeper in immutable references and immutable data structures. // address is in invalid state now, since the country hasn’t been set. // Address is valid and doesn’t have setters, so the address object is always valid. Since the object cannot be changed, it can be shared between threads without having race conditions or data mutation issues. Similar to the code example of the invalid state, it’s generally easier to use a constructor than initialization methods. This is because the constructor enforces the required arguments, while setter or initializer methods are not enforced at compile time. address.setOverseas(true); // address has now been mutated! The above code, in general, is bad practice. It returns a boolean as well as potentially changing the state of the object. This makes the code harder to understand and to test. A better solution would be to remove the setter from theAddress class, and return a boolean by testing for the country name. An even better way would be to move this logic to the Address class itself (address.isOverseas()). When state really needs to be set, make a copy of the original object without mutating the input. Imagine a money amount, say 10 dollars. 10 dollars will always be 10 dollars. In code, this could look like public Money(final BigInteger amount, final Currency currency). As you can see in this code, it’s not possible to change the value of 10 dollars to anything other than that, and thus, the above can be used safely for value types. A final reference does not make your objects immutable! Our final reference again didn’t help us in stopping us from mutating the person object. With the following guidelines in place, let’s design a better version of our Person class. this.addresses = List.copyOf(addresses);   // makes a copy of the list to protect from outside mutations (Java 10+). Now, the above code is immutable, but due to the design of the Person and Address class, while also having a final reference, it makes it impossible to reassign the person variable to anything else. However, since a new a copy is made in the constructor, the above code will no longer affect the copied address list reference in the Person class, making the code safe. Thanks all for spotting! I hope the above helps in understanding the differences between final and immutability. If you have any comments or feedback, please let me know in the comments below. One of the primary problems facing enterprises is the problem of moving from monolith to microservices. The larger the enterprise, the bigger their monolithic applications become, and it gets harder to refactor them into a microservices architecture. Everyone seems to agree on the benefits of microservices. We covered this topic at some length in this post. However, not many seem to agree on how to undertake the migration journey. Too often, the decision-making process turns into a chicken-and-egg problem. The bigger the monolith, the bigger the stakeholders’ and management’s footprint becomes. Too much management often leads to decision paralysis and, ultimately, the journey ends up as a mess. However, many organizations have successfully managed to make this transition. Often, it is a mix of good leadership and a well-defined strategy that determines success or failure. I know it is hard. But if you’ve decided to transition from a monolith to microservices, you have to follow this strategy. Think of the monolithic system as a hole in the ground. To get out of a hole, you don’t dig more. In other words, you don’t add to your problems. Often, organizations miss this part completely. They think about a grand migration strategy that will take years. However, business requirements come fast. Due to the lack of budget or time, teams end up implementing those requirements into the monolithic application. The grand migration strategy never starts for whatever reason. And, each addition to the monolith makes the goal-post move further ahead. In order to get around this, stop increasing the size of the monolith. Don’t implement new features in the monolithic code base. Every new feature or functionality should be implemented as services. This, in turn, reduces the growth rate of the monolithic application. In other words, new features implemented as services create inertia towards the migration. It also helps demonstrate the value of the approach and ensures continuous investment. Presentation logic that consists of modules implementing the web UI. This tier of the system is responsible for handling HTTP requests and generating HTML pages. In any respectable application, this tier has a substantial amount of code. Business logic that consists of modules handling the business rules. Often, this can be quite complex in an enterprise application. Data access logic that consists of modules handling the persistence of data. In other words, it deals with databases. Usually, there is a clean separation between presentation logic and business logic. The business tier exposes a set of coarse-grained APIs. Basically, these APIs form an API Layer. In other words, this layer acts as a natural border based on which you can split the monolith. This approach is also known as horizontal slicing. If done successfully, you’ll end up with smaller applications. One application will handle the presentation. The other application will handle the business and data access logic. There are various data management patterns for microservices that can be explored. You can develop, deploy, and scale both applications independently. In other words, UI developers can rapidly introduce changes to the interface. They don’t have to worry about the impact on the backend. You will also have a set of well-defined APIs. Also, these APIs will be remotely accessible for use in other microservices. This is the pinnacle of moving to a microservices architecture. The previous two strategies will take you only so far. Even if you successfully implement them, you’ll still have a very monolithic code base. Basically, they can act only as a spring-board to the real deal. If you want to make a significant move towards microservices, you need to break apart the monolithic code base. The best way to do this is by breaking up the monolith based on business functionality. Each business functionality is handled by one microservice. Each of these microservices should be independently deployable and scalable. Communication between these services should be implemented using remote API calls or through message brokers. By using this strategy, over time, the number of business functions implemented as services will grow and your monolith will gradually shrink. This approach is also known as vertical slicing. Basically, you are dividing your domain into vertical slices or functionalities. Moving from a monolith to microservices is not easy. It requires significant investment and management buy-in. On top of all that, it requires incredible discipline and skill from the team actually developing it. However, the advantages are many. Often, it is a good idea to start small on this journey. Rather than waiting for a big one-shot move, try to take incremental steps, learn from mistakes, iterate, and try again. Also, don’t try to go for a perfect design from the get-go. Instead, be willing to iterate and improve. Lastly, remember that microservices is not a destination but a journey. A journey of continuous improvement. Let me know your thoughts and experiences about this in the comments section below. In this piece, which originally appeared here, we’ll look at the challenges of refactoring SOAs to MSAs, in light of different communication types between microservices, and see how pub-sub message transmission — as a managed Apache Kafka Service — can mitigate or even eliminate these challenges. If you’ve developed or updated any kind of cloud-based application in the last few years, chances are you’ve done so using a Microservices Architecture (MSA), rather than the slightly more dated Service-Oriented Architecture (SOA). So, what’s the difference? With smaller sets of responsibilities for each service, it’s easier to isolate functionality. But what are microservices and how do MSAs compare to SOAs and monolithic applications? Simply put, microservices are a software development method where applications are structured as loosely coupled services. The services themselves are minimal atomic units which together, comprise the entire functionality of the entire app. Whereas in an SOA, a single component service may combine one or several functions, a microservice within an MSA does one thing — only one thing — and does it well. Microservices can be thought of as minimal units of functionality, can be deployed independently, are reusable, and communicate with each other via various network protocols like HTTP (more on that in a moment). Today, most cloud-based applications that expose a REST API are built on microservices (or may actually be one themselves). These architectures are called Microservice Architectures, or MSAs. On the continuum from single-unit, monolithic applications to coarse-grained service-oriented architectures, MSAs offer the finest granularity, with a number of specialized, atomic services supporting the application. For example, 37% of respondents building web apps reported that monitoring was a significant issue in one sample. Why? Some clues can be seen in some of the challenges cited by those refactoring legacy apps to MSAs — overcoming tight coupling was cited by 28% of respondents, whereas finding where to break up monolithic components was cited by almost as many. Monitoring services built on MSAs is more complicated (as opposed to SOAs or Monolithic apps) because of multiple points of failure (which exist potentially everywhere a service integrates with another). Tight coupling suggests components and protocols are inflexibly integrated point-to-point in monolithic apps or SOAs (making them difficult to maintain and build functionality around). Breaking up monolithic apps or large SOA components into atomic, independent, reusable microservices is challenging for exactly those first two reasons. Also, what sort of problems can one expect when your application scales? We’ll look at these and suggest a solution below. But there’s one question that underlies all of the above concerns: Once we do manage to break up our apps into atomic services, what’s the best way for these services to communicate with each other? Synchronous communication is when the sender of the event waits for processing and some kind of reply, and only then proceeds to other tasks. This is typically implemented as REST calls, where the sender submits an HTTP request, and then the service processes this and returns an HTTP response. Synchronous communication suggests tight coupling between services. Asynchronous communication means that a service doesn’t need to wait on another to conclude its current task. A sender doesn’t necessarily wait for a response, but either polls for results later or records a callback function or action. This typically is done over message buses like Apache Kafka and/or RabbitMQ. Asynchronous communication actually invokes loose coupling between component services, because there can be no time dependencies between sending events and a receiver acting on them. In this case, each request has one sender and one receiver. If there are multiple requests, they should be staggered, because a single receiver cannot receive and process them all at once. Again, this suggests tight coupling between sender and receiver. As the category indicates, there are multiple receivers processing multiple requests. We believe that, while each of these methods (in combination) have their purpose within an MSA, the most loosely coupled arrangement of all is when microservices within a distributed application communicate with each other asynchronously, and via multiple receivers. This option implies that there are no strict dependencies between the sender, time of send, protocol, and receiver. The pub-sub communication method is an elaboration on this latter method. The sender merely sends events — whenever there are events to be sent— and each receiver chooses, asynchronously, which events to receive. Apache Kafka may be one of the more recent evolutions of pub-sub. Apache Kafka works by passing messages via a publish-subscribe model, where software components called producers publish (append) events in time-order to distributed logs called topics (conceptually a category-named data feed to which records are appended). Consumers are configured to separately subscribe from these topics by offset (the record number in the topic). This latter idea — the notion that consumers simply decide what they will consume — removes the complexity of having to configure complicated routing rules into the producer or other components of the system at the beginning of the pipe. We argue that, when asynchronous communication to multiple receivers is required, Apache Kafka is a promising way to go, as it solves the problem of tight-coupling between components and communication, is monitorable, and facilitates breaking up larger components into atomic, granular, independent, reusable services. When the routing rules are configured by the consumer (a feature of pub-sub and Apache Kafka generally), then, as mentioned, there is no need to build additional complexity into the data pipe itself. This makes it possible to decouple components from the message bus (and each other) and develop and test them independently, without worrying about dependencies. All of the above makes it reasonably simple to decouple components and focus on a specific part of the application. Asynchronous messaging, when used correctly, removes yet another point of complexity by letting your services be ready for events without being synced to them. It’s easier to have peace of mind about breaking up larger, SOA-type services into smaller, more atomic ones when you don’t have to worry about communication latency issues. Aiven managed Kafka services have been benchmarked and feature the highest throughput and lowest latency of any hosted service in the industry. Apache Kafka was built to leverage the best of what came before while improving on it even more. However, Apache Kafka can be challenging to set up. There are many options to choose from, and these vary widely depending on whether you are using an open-source, proprietary, free, or paid version (depending on the vendor). What are your future requirements? If you were choosing a bundled solution, then your choice of version and installation type, for example, may come back to haunt you in the future, depending on the functionality and performance you later decide you need. These challenges alone may serve as a compelling argument for a managed version. With the deployment, hardware outlay costs and effort and configuration out of your hands, you can focus entirely on the development for which you originally intended your Kafka deployment. What’s more, managed is monitorable. Are you tracking throughput? You need not worry about where the integration points are in your app to instrument custom logging and monitoring; simply monitor each of your atomic services’ throughput via your provider’s Kafka backend and metrics infrastructure. What sort of problems can you expect when your application scales? Bottlenecks? Race conditions? A refactoring mess to accommodate for them? A managed Kafka solution can scale automatically for you when the size of your data stream grows. As such, you needn’t worry when it’s time to refactor your services atomically, and you needn’t force your teams to maintain blob-style, clustered services with complicated dependencies just for the sake of avoiding latency between them. If you’re managing your own cluster, you can expect to be tied down with installs, updates, managing version dependencies, and related issues. A managed solution handles all of that for you, so you can focus on your core business. Apache Kafka is already known for its high availability, so you never have to worry about your services being unable to communicate because a single node supporting your middleware is down. Kafka’s ability to handle massive amounts of data and scale automatically lets you scale your data processing capabilities as your data load grows. And a managed solution has redundancy built right in. We looked at some common challenges of refactoring from SOAs to MSAs: monitorability, tight coupling of components, and the challenges of breaking up larger monolithic or SOA components into microservices. RandomAccess is a marker interface, like the Serializable and Cloneable interfaces. All these marker interfaces do not define methods. Instead, they identify a class as having a particular capability. In the case of Serializable, the interface specifies that if the class is serialized using the serialization I/O classes, a NotSerializableException will not be thrown (unless the object contains some other class that cannot be serialized). Cloneable similarly indicates that the use of the Object.clone( ) method for a Cloneable class will not throw aCloneNotSupportedException. The RandomAccess interface identifies that a particular java.util.List implementation has fast random access. (A more accurate name for the interface would have been “FastRandomAccess.”) This interface tries to define an imprecise concept: what exactly is fast? The documentation provides a simple guide: if repeated access using the List.get( ) method is faster than repeated access using the Iterator.next( ) method, then the List has fast random access. The two types of access are shown in the following code examples. This last loop relies on the normal situation where List objects cannot change in size while they are being iterated through without an exception of some sort occurring. So, because the loop size remains the same, you can simply count the accessed elements without testing at each iteration whether the end of the list has been reached. This last loop is generally faster than the previous loop with the Iterator.hasNext( ) test. In the context of the RandomAccess interface, the first loop using List.get( ) should be faster than both the other loops that use Iterator.next( ) for a list to implement RandomAccess. So now that we know what RandomAccess means, how do we use it? There are two aspects to using the other marker interfaces, Serializable and Cloneable: defining classes that implement them and using their capabilities via ObjectInput /ObjectOutput and Object.clone( ), respectively.RandomAccess is a little different. Of course, we still need to decide whether any particular class implements it, but the possible classes are severely restricted: RandomAccess should be implemented only in java.util.List classes. And most such classes are created outside of projects. The SDK provides the most frequently used implementations, and subclasses of the SDK classes do not need to implement RandomAccess because they automatically inherit the capability where appropriate. I tested the four code loops shown in this section, using the 1.4 release, separately testing the -client (default) and -server options. To test the effect of the RandomAccess interface, I used the java.util.ArrayList and java.util.LinkedList classes. ArrayList implements RandomAccess, while LinkedList does not. ArrayList has an underlying implementation consisting of an array with constant access time for any element, so using the ArrayList iterator is equivalent to using the ArrayList.get( ) method but with some additional overhead. LinkedList has an underlying implementation consisting of linked node objects with access time proportional to the shortest distance of the element from either end of the list, whereas iterating sequentially through the list can shortcut the access time by traversing one node after another. Times shown are the average of three runs, and all times have been normalized to the first table cell, i.e., the time taken by the ArrayList to iterate the list using the List.get( ) method in client mode. The most important results are in the last two rows. The last line shows the times obtained by making full use of the RandomAccess interface, and the line before that shows the most optimal general technique for iterating lists if RandomAccess is not available. The size of the lists I used for the test (and consequently the number of loop iterations required to access every element) was sufficiently large that the instanceof test had no measurable cost in comparison to the time taken to run the loop. Consequently, we can see that there was no cost (but also no benefit) in adding the instanceofRandomAccess test when iterating the LinkedList, whereas the ArrayList was iterated more than 20% quicker when the instanceof test was included. You may want to include code referencing RandomAccess without moving to 1.4. Many projects need their code to be able to run in any VM, so the code needs to be backward-compatible to run in VMs using releases earlier than 1.4, where RandomAccess does not exist. You will want to make your code forward-compatible so that it automatically takes advantage of RandomAccess when running in a 1.4+ JVM. With the guarded instanceof test, the code automatically reverts to the Iterator loop if RandomAccess does not exist and should avoid throwing a NoClassDefFoundError in pre-1.4 JVMs. And, of course, the guarded instanceof test also automatically uses the faster loop branch whenRandomAccess does exist and the list object implements it. Singleton is a part of Gang of Four design pattern and it is categorized under creational design patterns. In this article, we are going to take a deeper look into the usage of the Singleton pattern. It is one of the most simple design pattern in terms of the modelling but on the other hand this is one of the most controversial pattern in terms of complexity of usage. 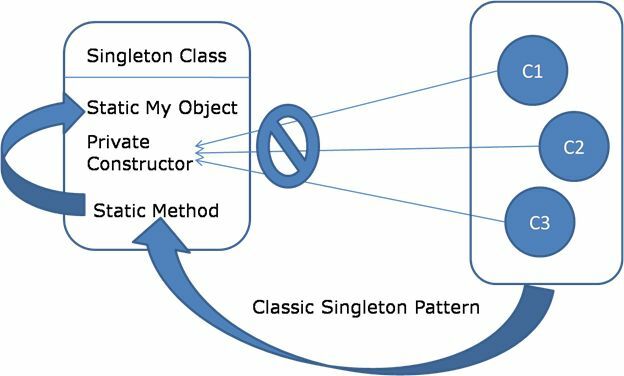 Singleton pattern is a design pattern which restricts a class to instantiate its multiple objects. It is nothing but a way of defining a class. Class is defined in such a way that only one instance of class is created in the complete execution of program or project. It is used where only a single instance of class is required to control the action throughout the execution. A singleton class shouldn’t have multiple instances in any case and at any cost. Singleton classes are used for logging, driver objects, caching and thread pool, database connections. It should have only one instance : This is done by providing instance of class from within the class. Outer classes or subclasses should be prevented to create the instance. This is done by making the constructor private in java so that no class can access the constructor and hence cannot instantiate it. Instance should be globally accessible : Instance of singleton class should be globally accessible so that each class can use it. In java it is done by making the access-specifier of instance public. Early initialization : In this method, class is initialized whether it is to be used or not. Main advantage of this method is its simplicity. You initiate the class at the time of class loading. Its drawback is that class is always initialized whether it is being used or not. Lazy initialization : In this method, class in initialized only when it is required. It can save you from instantiating the class when you don’t need it. Generally lazy initialization is used when we create a singleton class. java.lang.Runtime : Java provides a class Runtime in its lang package which is singleton in nature. Every Java application has a single instance of class Runtime that allows the application to interface with the environment in which the application is running. The current runtime can be obtained from the getRuntime() method. An application cannot instantiate this class so multiple objects can’t be created for this class. Hence Runtime is a singleton class. java.awt.Desktop : The Desktop class allows a Java application to launch associated applications registered on the native desktop to handle a URI or a file. launching a registered application to open, edit or print a specified file. This class provides methods corresponding to these operations. The methods look for the associated application registered on the current platform, and launch it to handle a URI or file. If there is no associated application or the associated application fails to be launched, an exception is thrown. Each operation is an action type represented by the Desktop.Action class. This class also cannot be instantiated from application. Hence it is also a singleton class. Hardware interface access: The use of singleton depends on the requirements. Singleton classes are also used to prevent concurrent access of class. Practically singleton can be used in case external hardware resource usage limitation required e.g. Hardware printers where the print spooler can be made a singleton to avoid multiple concurrent accesses and creating deadlock. Logger : Singleton classes are used in log file generations. Log files are created by logger class object. Suppose an application where the logging utility has to produce one log file based on the messages received from the users. If there is multiple client application using this logging utility class they might create multiple instances of this class and it can potentially cause issues during concurrent access to the same logger file. We can use the logger utility class as a singleton and provide a global point of reference, so that each user can use this utility and no 2 users access it at same time. Configuration File: This is another potential candidate for Singleton pattern because this has a performance benefit as it prevents multiple users to repeatedly access and read the configuration file or properties file. It creates a single instance of the configuration file which can be accessed by multiple calls concurrently as it will provide static config data loaded into in-memory objects. The application only reads from the configuration file at the first time and there after from second call onwards the client applications read the data from in-memory objects. Cache: We can use the cache as a singleton object as it can have a global point of reference and for all future calls to the cache object the client application will use the in-memory object. Singleton classes can have only one instance and that instance should be globally accessible. java.lang.Runtime and java.awt.Desktop are 2 singleton classes provided by JVM. Singleton Design pattern is a type of creational design pattern. Outer classes should be prevented to create instance of singleton class. How to prevent Singleton Pattern from Reflection, Serialization and Cloning? In this article, we will see that what are various concepts which can break singleton property of a class and how to avoid them. There are mainly 3 concepts which can break singleton property of a class. Let’s discuss them one by one. After running this class, you will see that hashCodes are different that means, 2 objects of same class are created and singleton pattern has been destroyed. Overcome reflection issue: To overcome issue raised by reflection, enums are used because java ensures internally that enum value is instantiated only once. Since java Enums are globally accessible, they can be used for singletons. Its only drawback is that it is not flexible i.e it does not allow lazy initialization. As enums don’t have any constructor so it is not possible for Reflection to utilize it. Enums have their by-default constructor, we can’t invoke them by ourself. JVM handles the creation and invocation of enum constructors internally. As enums don’t give their constructor definition to the program, it is not possible for us to access them by Reflection also. Hence, reflection can’t break singleton property in case of enums. Serialization:- Serialization can also cause breakage of singleton property of singleton classes. Serialization is used to convert an object of byte stream and save in a file or send over a network. Suppose you serialize an object of a singleton class. Then if you de-serialize that object it will create a new instance and hence break the singleton pattern. As you can see, hashCode of both instances is different, hence there are 2 objects of a singleton class. Thus, the class is no more singleton. Overcome serialization issue:- To overcome this issue, we have to implement method readResolve() method. Above both hashcodes are same hence no other instance is created. Cloning: Cloning is a concept to create duplicate objects. Using clone we can create copy of object. Suppose, we ceate clone of a singleton object, then it wil create a copy that is there are two instances of a singleton class, hence the class is no more singleton. Two different hashCode means there are 2 different objects of singleton class. Overcome Cloning issue:- To overcome this issue, override clone() method and throw an exception from clone method that is CloneNotSupportedException. Now whenever user will try to create clone of singleton object, it will throw exception and hence our class remains singleton. Now we have stopped user to create clone of singleton class. If you don;t want to throw exception you can also return the same instance from clone method. Now, as hashcode of both the instances is same that means they represent a single instance.